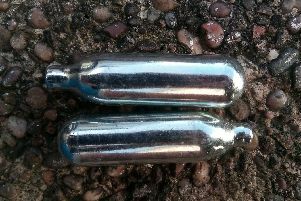 Gas canisters have been discovered in several other parts of Sheffield – after a great-grandmother raised concern that youngsters are using them to inhale potentially deadly fumes. The 81-year-old woman found 116 empty cream chargers within a matter of days earlier this month in an alleyway close to her Woodhouse home. After The Star uncovered the discovery this morning, a number of other residents have come forward on Facebook to say it is a much wider problem in the city. Ann Birtles said: “I work all over Sheffield and there is no area from Hillsborough to Dore where I haven’t seen these discarded in the streets. Nikki Johnston said she “sees them all the time” from Upperthorpe to Walkley. The great-grandmother who found them in Woodhouse warned it could only be a matter of time before the craze claims a life in Sheffield.